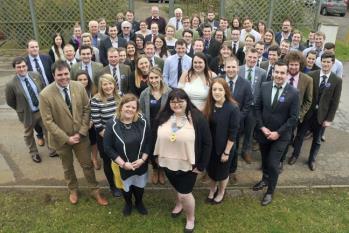 The National Federation of Young Farmers’ Clubs’ Council voted to support its Board of Management and Officer team at the Council meeting in Coventry on 20 October 2018. A clear majority (83%) of all Council members present, which included representatives from County Federations across England and Wales, voted against the motion of a vote of no confidence in the Board. During the meeting two amendments to the vote of no confidence were put forward and both were also defeated. The members of Council and the Board of Management are committed to working together to develop the strategic plan and ensure the Federation continues to support thousands of rural young people. The Council also agreed to appoint a Working Group of YFC members to lead on the membership’s input to the organisation’s strategic plan. The weekend also included meetings and reports from each of the five steering groups on issues relating to agriculture, competitions, events and marketing, youthwork, travel, training, rural and youth related issues. Fay Thomas, Herefordshire FYFC, Chair of the Competitions Steering Group announced the date and location of the Performing Arts and Senior Member of the Year national finals in 2019. Performances and Senior Member of the Year interviews will take place in Leamington Spa in Warwickshire on 11 May – the same weekend as the Annual General Meeting, which is to be held on Sunday 12 May. It was also confirmed that the Choir and Ballroom Dancing competitions will be held in Staffordshire during Competitions Day in July. The 2019/20 competitions programme was also revealed with Commercial Dance, Cheerleading, Kwik Cricket, Football, Netball and an environmentally themed Cube Exhibit among the line up. The 2018-19 competitions year begins in November at the English Winter Fair with teams competing in the Live & Carcase competitions at Bingley Hall, Stafford. Chair of the Events and Marketing Steering Group Michael Wood, from East Riding of Yorkshire FYFC, announced that the group will be looking into the feasibility of hosting future national events using feedback gathered through the strategic plan. The steering group also wanted to encourage clubs to add the social media Curve modules to their spring programming as updates are currently being made to the content of these useful modules. Events were also a highlight in the AGRI Steering Group report from Chair James Hutchinson, Wiltshire FYFC, including news that NFYFC would be at AgCareersLive (stand 39) at Villa Park, Birmingham on 15 November. Plans for a fringe event at the Oxford Farming Conference with the Rural Youth Project were promoted, as well as plans for a regional AGRI event in Warwickshire. The group is also looking at organising a weekend event in Derbyshire in early 2019 comprising farm and diversified business visits, discussions with young conservationists and farm walks. George Goodwin, Staffordshire FYFC, Chair of the Personal Development Steering Group was pleased to announce that the Curve training target that had been set for 2017-18 had been exceeded. There were a total of 2,933 YFC members completing Curve modules and 26 counties delivering training during the year. Three new Curve modules will also be made available for clubs to run, which include Anti-bullying, Future Farming and Equaliteas. All steering groups discussed supporting the #iWill campaign, with a focus on the environment, and proposals are being developed for ways clubs and counties can get involved. Finally, Meg Watkins from Herefordshire FYFC, gave the report for the Youth Forum and discussed the developments to the Watch that Cowpat game. New fact cards have been created to support the game and will be shared with committees in February. The Forum has also had two motions added to the British Youth Council’s manifesto concerning lack of affordable rural housing and rural mental health. A full report from the weekend’s Council meetings will be made available to county offices this week. Any YFC members with questions about the Council meeting should speak to their County Representative in the first instance.